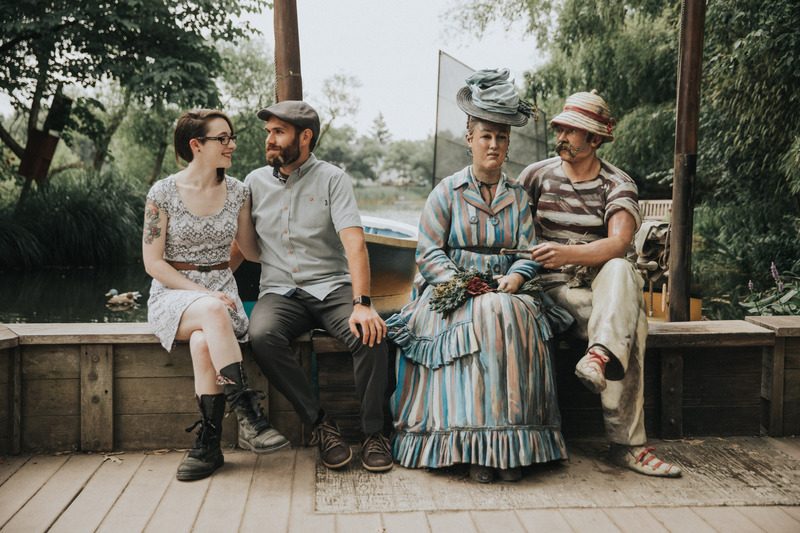 Everyone wants to look fabulous for their engagement session before the wedding day, but many couples get hung up on or unsure how to dress as the date approaches. If you are total fashionistas, you can disregard most of this guide and break all the rules. But otherwise these tips will help you both look and feel amazing! 1. Match your outfit to the location. We want your photos to look like you went on an a date in an interesting place and we just captured amazing moments along the way. So pretend you are actually are going on a dinner date and dress accordingly. You will nail the look and fit in perfectly with your surroundings. You won’t see many couples walking to a nice bistro in lower Manhattan in flip flops and a printed T-shirt. Likewise, it seems unlikely you would be sitting together on the beach along the Jersey Shore in a suit and tie. A formal location in the city or other urban area is great for cocktail attire while you can feel free to leave the shoes at home for a beach session. That said, this is the one rule that is broken most often. A stunning dress in the woods or on a mountain top can really make a statement. Lastly and most importantly, the keyword to keep is mind is “date”. You may wear comfy sneakers to walk around a park but would go beyond if there was someone you were trying to impress! 2. Be comfortable in your own clothing. 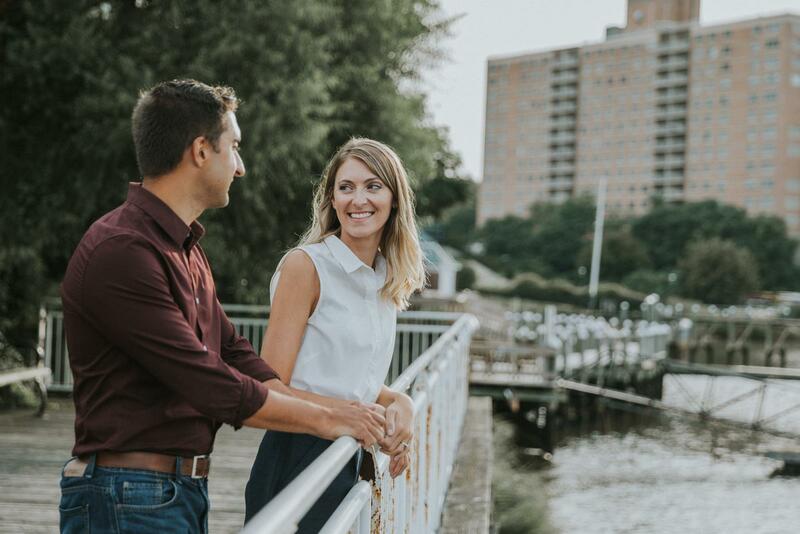 Our engagement sessions are dynamic and you will embrace, walk, sit, kiss, and perhaps even climb a bit in certain places. Ensure the clothing you choose allows you move freely and that you know how to look your best wearing it. If you have to constantly tuck in your shirt or adjust your dress every time you pick up your arms, it might be best to pick something else easier to deal with so that you feel more confident! 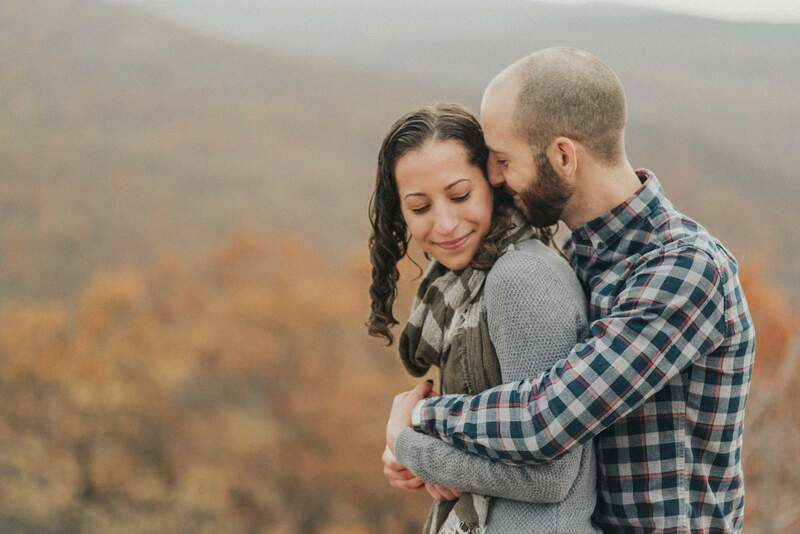 Our favorite images come from sessions that flow well where the couple can stay in the moment, be into each other, and let everything else fade away. If you never have worn a suit before or never leave the house in that knee high skirt, check it out in your mirror in advance so that feel totally confident. An important note about shoes: heels look beautiful and elongate your legs, but don’t wear them to a grassy park, the woods, or on the sand unless you are an expert walking in them. 3. Stand out in color, patterns, and prints. Colors and patterns photograph well and can make you really pop out from the surroundings. Various prints do an excellent job of showing off your figure while hiding any parts you don’t want to accentuate. If you are worried about overdoing it – mix and match! You can wear a beautiful patterned dress to go with a muted color of your fiance’s shirt. However, avoid any colors that venture into neon or even overly bright territory. More natural colors tend to mesh better with the world around. Think of the general tones of the location to play off of. Don’t wear greens to a forest with the trees and grass or you will get lost in the background – try a blue or even red dress. Neutral browns, greys, and beige are always a safe choice and will work in almost any location. Black is considered slimming, but it also shows every single bit of dirt, dust, and hair so is best to avoid unless you are also carrying a lint roller. Pure white should be reserved for your wedding day to make the wedding day photos stand out. If we are meeting you on a football field, absolutely bring out your team’s Jerseys. But otherwise brand names and logos distract from your interaction together as everyone tries to figure out what your shirt says. Stick to clothing that keeps the focus on you! 4. Complement each other – but don’t match! 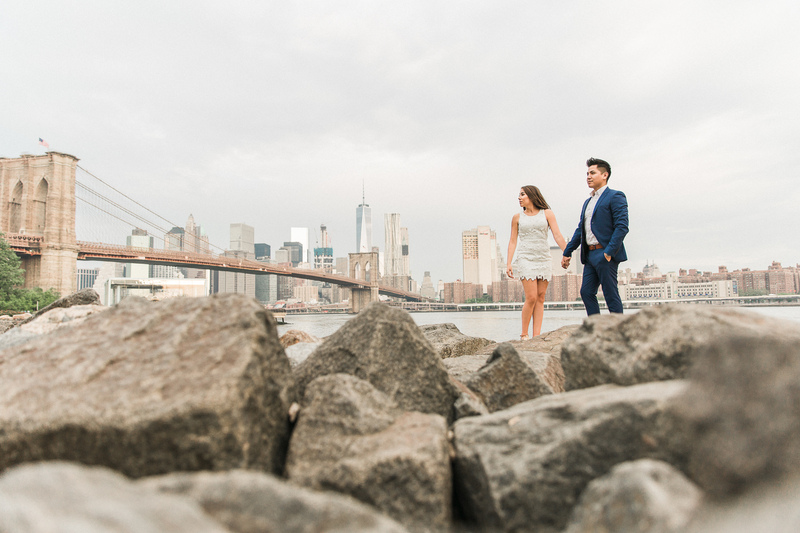 You should look like you are both going to same place and belong together on the day of your engagement session. If you are going to dress to the nines, have your fiance wear his best suit as well instead of grabbing a t-shirt and jeans. Look coordinated by wearing colors that compliment each other well and have some common shades between them. Or mix some more pastel colors and neutrals for a safe and timeless look. But don’t choose perfectly matching outfits unless you plan to look like twins instead of an engaged couple. 5. Layer up to look great and work with the weather. Layered clothing adds interest by breaking up colors and patterns while giving you an easy second look built into your first. Start off with your sweaters and jackets for the first half of the session and then take them off for a completely different look without needing a changing room. Layering is also an easy way to make yourself look and feel great while hiding anything you may not want to flaunt. Even if the weather says it will be perfect 75 degrees, assume it could be a fair bit cooler in the shade as the sun goes down or significantly hotter in the sun as we walk from between different spots. Having an outer layer you can take on and off does wonders for temperature control and lets you avoid sweating, freezing, or both! 6. Show off your personalities. 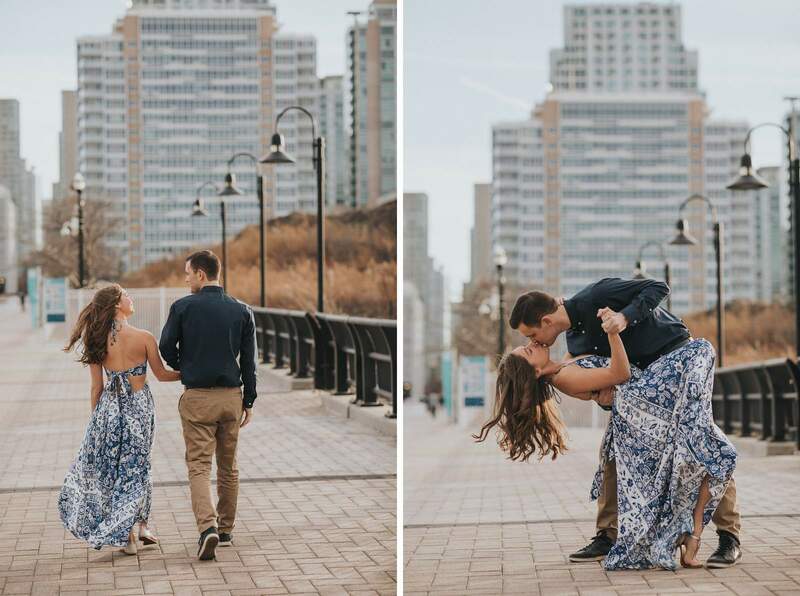 An engagement session is an enjoyable and artistic expression of you together and we want you to recognize and love yourselves in the photos! Don’t force yourself into an outfit you have never and never will wear again just because someone else told you it looks good. Pick what you think makes you looking handsome, beautiful, and stunning. Feeling amazing in your clothing allows your happiness and love really shine through into the images we capture. 7. A note about hair. A great hair style can takes photos to the next level but there two factors to consider; the wind and back lighting. The great outdoors typically has wind – especially near the water and open spaces without many trees. Hair will fly all over the place; in your face, in your fiance’s mouth, and everywhere else. Also, when the sun begin to sets at your back, it tends to light up even individual lose strands of hair and can really make them stand out. Everyone’s hair is different but if you have a style that tends to keep your hair together and back, that may be a good one if we are going to meet somewhere on the waterfront.